Of the small backyard landscaping ideas, this is one that every small backyard owner can utilize. Homeowners can create the illusion of having a larger garden than they do by simply subtly slanting the far lines of their backyard towards one another. Add some large shrubs along the outside of the yard and it will look substantially larger than it actually is. Having brightly colored plants and flowers placed right in front of your garden where they can be easily viewed won’t only enliven your backyard, but they’ll immediately catch the attention of yourself and any guests and draw less attention to the size of your yard. Boldly colored and uniquely designed potted plants are not only a great way to keep plants easily contained, but it allows those with a smaller space to add a variety of greenery and foliage to a backyard area that may not have area to plant in. 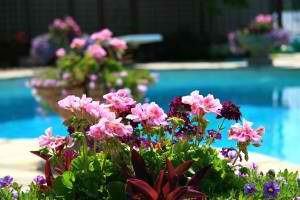 If you happen to have a pool or spa, potted plants are ideal for easy pool landscaping. When it comes to small backyard landscaping ideas and tips, arbors and pergolas are almost always on the list. Both offer homeowners a great way to not only create a shaded spot in their backyard, but they create a frame in you backyard which naturally creates a view. This helps give you tinier backyard a grand view. TIP: You can also create a view by getting creative with the placement of small trees, lush shrubs, or even DIY garden art!